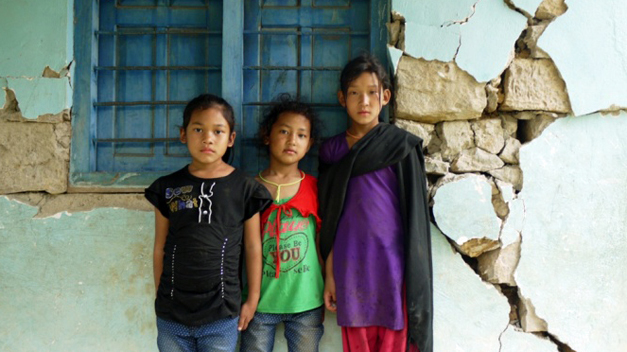 Friends and family members supported the start of the project with a birthday gift for Nepal. And thus a wish becomes reality with the new project: ‘A school for Nepal’. In May 2015 we had our first meeting with the Maya Foundation, that has supported, amongst other things, the improvement of Nepalese education aided by volunteers. By supporting the Maya Foundation a start can be made with the reconstruction of a primary school. We want to involve all teachers in existing and new educational projects to realize the reconstruction of an earthquake proof school. That school will be a place for Nepalese children to meet each other again, continue their education and grow up together. Our motto is ‘You can’t learn on your own’. So we are starting a sustainable cooperation between pupils and teachers in Nepal, the Netherlands and many other countries. For the reconstruction of a school that far away we not only need words, actions and (financial) support, but above all the support and energy of many people! What could be more beautiful than the complete involvement of pupils in cooperative learning in a useful project for themselves and for others. Meaningful education, active citizenship, 21st century skills, internationalisation, expedition education … these are qualifications that will be put into practice in our education. The Learning Circles Children’s Rights: From February till the end of May 2016, pupils from over a hundred schools are working together in global classes doing research about international issues related to children’s rights using the internet, email and social media. The pupils will both develop their skills and broaden their knowledge, which they will need in an ever changing world, a world that needs people willing to build something together. At the same time teachers and pupils will make sustainable international cooperation possible. They are challenged in various ways to find answers to questions that are not always easy, to give feedback to each other and to work together. This is the feedback that pupils from the Spring project have given us: ‘Now that we have done research and talked about children’s rights a lot, we realize that we actually have to do something to change things!’ In 2016, children from the Learning Circles will make the reconstruction of a school in Nepal possible by their active participation in coming up with ideas for fund raising. 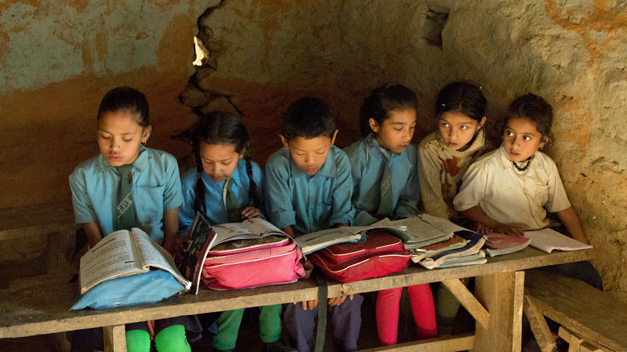 Expedition Education: Roll up your sleeves for a school in Nepal! The aim is personal growth, but also using your newly discovered skills and talents to help others. Working together for a year in a team of pupils from your own school, thus turning a meaningful international project into a success. That has been the purpose of expedition education since the start in 2007. Together with their coach the team will look into social problems that occur somewhere in the world. This is done with mutual respect and on a reciprocal basis. Expedition education is aimed at broadening knowledge and skills. But expedition education also stimulates an active learning attitude and offers a possibility for the realization of ‘concerned citizenship’, caring for the world. That’s why the team travels to the country in question, to experience first-hand how important it is to learn with the world not just about the world. 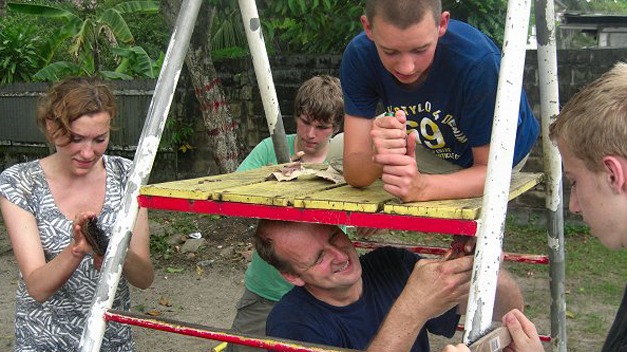 In many previous expeditions, sustainable cooperations have been accomplished, resulting in many completed projects and rich learning experiences for lots of pupils. For example, we have refurbished an orphanage in Rumania, improved sanitary conditions of a primary school in Peru, realized an environmental project in Taiwan, and done up a school for children with special needs in Surinam. These are ideas that were realized by many enthusiastic expedition teams. These projects were always aimed at realizing a lasting and sustainable contribution for the local community based on mutual respect. The Nepal expedition will have a major share in the realization of the reconstruction of a school in the academic year 2015-2016. 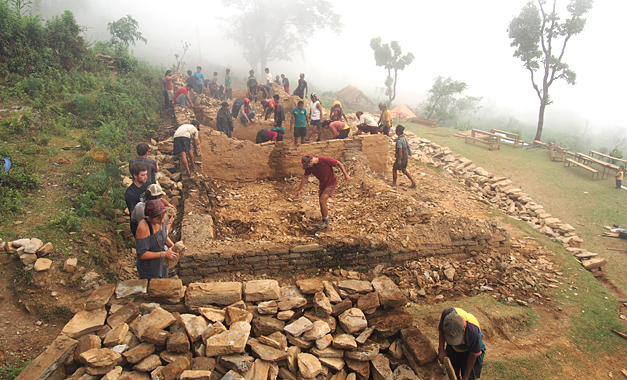 It’s no coincidence that we made contact with the Maya Foundation in the same week that the ‘birthday wish’ sprang to mind, and that ideas came up from various projects to support the reconstruction for a school in Nepal. We got acquainted with founder René Voss. This foundation has helped the inhabitants of the Kaski district and surrounding area since 2004 by locally supported projects involving education, health care, and rural development. We are working together with the Maya Foundation and conferring with them to select a school that can be (re-)built. They have contacts with both Nepalese and Dutch builders. It’s also important to us that we have local people that are willing to report (through us) about the progress of the project and report to the pupils of the Learning Circles and the Expedition group. 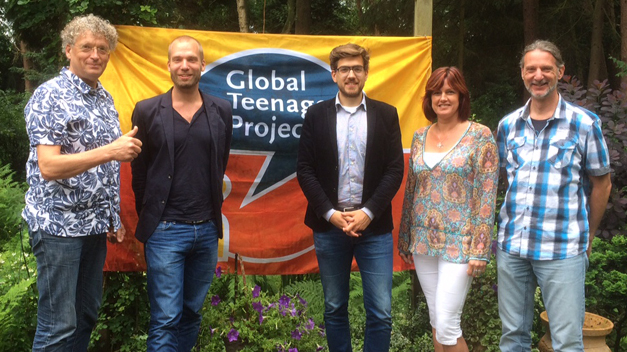 We are also preparing a trip to Nepal by the pupils of the Grundel Expedition group, which is planned for Spring 2016. Apart from financial support, the Maya Foundation is also aimed at transferring knowledge. The aim is to work towards the ability of the local community to cope for themselves. For this reason, we work together with local partner organizations, the local government and the Nepalese people themselves. In the Netherlands, we often cooperate with schools of higher education and incidentally with universities or schools for vocational education. The foundations involves interns from these schools that do research and assist with managing the projects. The past year Lyceum de Grundel‘ opted for a great challenge: the development of ‘future oriented education’ in cooperation with Bob. Future oriented education offers a challenging, contemporary education that teaches pupils to be fully aware of their own education and to take more control of how they learn. On the 17th of August 2015, five classes of year two, each with their own tutor/coach, got to work. It was wonderful to see the pupils, their tutors and teachers get started with great enthusiasm. 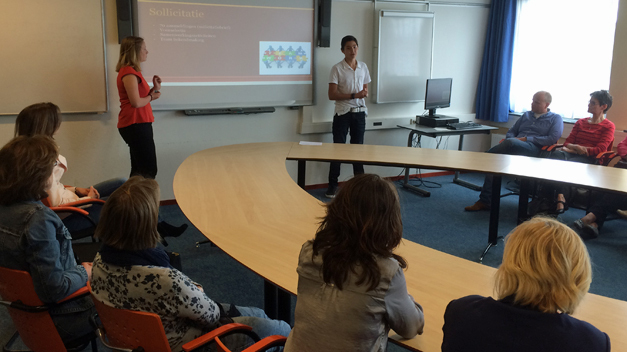 In May of this year, a team of over 20 teachers of ‘de Grundel’ paid a visit to another secondary school called ‘Corlaer College’ in Nijkerk, the Netherlands. The team were given a warm welcome and attended a presentation about the Corlaer Expedition Education … pupils having that much ownership of their own learning process! Made enthusiastic by this ‘Expedition virus’, ‘de Grundel’ is also forming an expedition team. What would be better than to connect this expedition team to the challenge of rebuilding a school in Nepal. There must be a hundred reasons or more why this is hard to include in the curriculum or impossible to achieve. However, there can be only one reason why with enormous enthusiasm and effort, the pupils and teachers of ‘de Grundel’ will succeed: ‘It can’t be done’ doesn’t exist. Check out the FaceBook Page of Expeditie Nepal and the Expeditie Nepal page on this site. Update Oktober 2015: A school in Harmi. 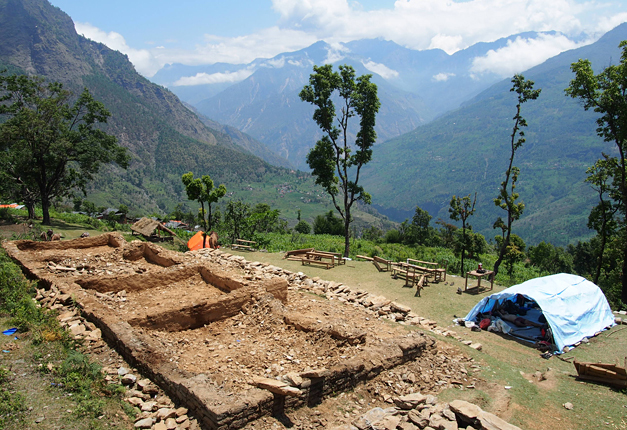 Together with Expedition Nepal of ‘Lyceum de Grundel’ we are going to rebuild a secondary school in Harmi using an earthquake resistant building technique (with so called earth bags). The building is being supervised by Kenny, an American with over 20 years of experience with this building technique. He will remain at the construction site for two months. 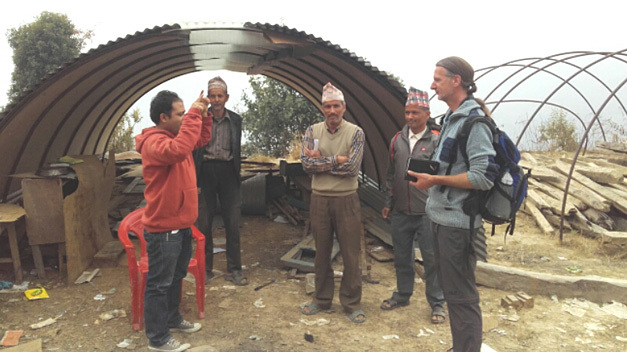 Other members of the team are the New Zealander Tes (who was already in Nepal when the earthquake happened and offered emergency relief when visiting that location) and two Dutchmen, Bert and Geert. Bert has been in construction for over 45 years so he has a wide experience (he is retired now) and he has supervised several building projects for the Maya Foundation, one of them being our studio using the same building technique with the earth bags. Geert has been working in construction for over 40 years. The De Mahendra Leela Higher Secondary School is situated in the district Ghorka where the epic centre of the first quake was. 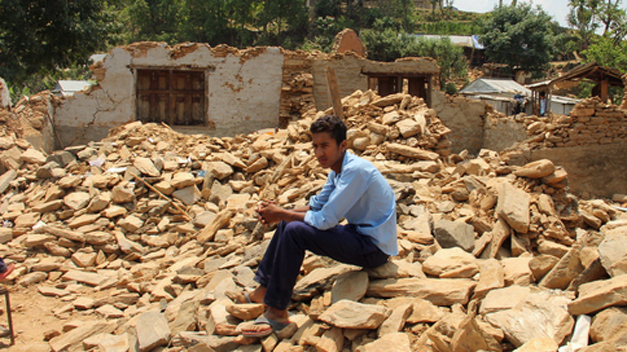 Nineteen classrooms were destroyed… The location can be reached by bus from Kathmandu (5 to 6 hours) followed by a 2- to 4-hour-journey on foot. The local population consists mainly of Buddhists, but also Hindus and Christians live there. 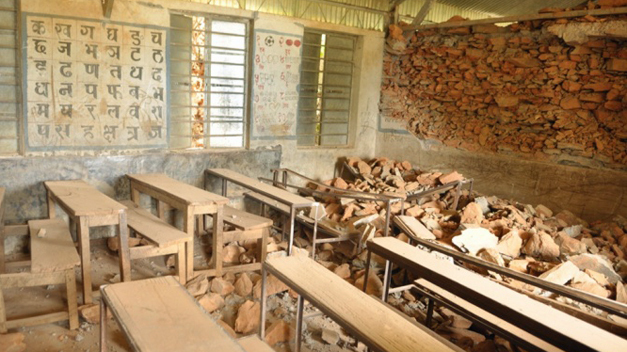 Before the earthquake struck, the school had well over a hundred pupils. But chances are that, after we will have rebuilt the school, pupils from neighboring villages will also attend this school. Therefore we are expecting a total of 300 pupils.